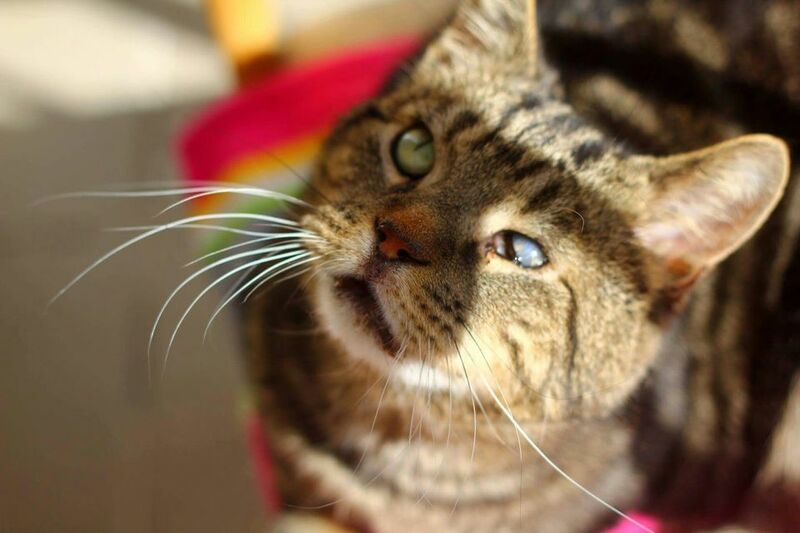 A blind cat can have a wonderful, happy life. It is not at all uncommon for pets, particularly older ones, to suffer vision loss. Normal cat vision is close to humans or perhaps just a little less. Pets have more problems focusing on near objects than people do, though, which is why your kitty may have some trouble seeing the last few kibbles in the food bowl. Just as people over the age of 40 tend to need reading glasses, the same vision changes start to develop in almost all cats over the age of five. This normal change, called nuclear sclerosis, results in less flexibility of the lens, a hazy appearance, and less ability to focus on close objects. Pets still see pretty well despite the bluish tint to their eyes. Eye disorders can affect the vision of pets at any age but are more common in older animals. Cataracts turn the clear lens of the eye cloudy and opaque and ultimately result in blindness. Older pets also can suffer glaucoma—an increased pressure within the eyeball that can be very painful and leads to blindness. There are treatments available for cataracts and glaucoma. Pain control in glaucoma is particularly important. But techniques such as cataract surgery that can reverse the blindness are pretty expensive and are limited to specialty veterinary ophthalmology practices. It is not cruel to allow your pet to function as a blind pet. In fact, blind pets are not nearly as concerned about their deficit as most owners. When your pet becomes blind, the cat will just rely on its sense of smell and hearing. In many cases, vision loss is gradual, and pets adjust and make accommodations so successfully that owners are surprised to discover that their aging cat has become blind. Blind cats typically are still very happy. They continue to enjoy and remain engaged in life and the world around them—including their humans. Kitties do not need to see you to love you. Your blind pet’s comfort level, safety, and emotional health are important. Follow these tips to keep the cat happy and comfortable. Do not move food or litter box: It is vital to keep the food, water bowls, litter box, and pet beds in the same spot, so your cat can easily find belongings. Do some scent marking: It may be helpful to “scent” important objects for the cat with strong odors such as peppermint to help its nose “see” what it is looking for. Avoid rearranging the furniture: Blind pets memorize and "mind-map" the house, and moving things around will confuse the cat. It is not at all unusual for a blind cat, for instance, to still insist on making floor-to-counter leaps with confidence as long as its memory remains fresh and accurate. Safeguard dangerous zones: Pad the sharp edges of furniture with bubble wrap until your cat learns to avoid the danger. Block off steep stairways with baby gates to prevent falls. Use your voice to guide your cat: Your pet’s personality and behavior may change a bit as vision fades. Some pets become more dependent on the owner, and act “clingy”—basically they will treat you as a guide, stand very close, and follow you around. Get in the habit of speaking to your cat when you enter or leave a room to help it keep track of your whereabouts. Attach a bell to other animals in the house: In multiple pet homes, another cat or dog may serve as a guide for the blind pet. Help your blind pet by attaching a bell or other noisemaker to the other animal's collar. Create a safe spot in each room: To avoid tripping over the pet that is always underfoot, provide a safe, comfy bed in each room. Very social cats may become standoffish once vision fades. They may want to avoid contact with houseguests to avoid being stepped on. Don't startle your cat: Blind pets also startle more easily, so always speak to your cat before petting him to avoid being accidentally nipped or swatted in reflex.